How to Evaluate Candidates after an Interview? Interview procedure can be stressful for the candidates, but the interviewers too are under the pressure to choose the right candidate for the open position. They evaluate the number of candidates on various criteria. After several interviews, one may feel confused while taking a final call. Moreover, if the interview panel has more than 2-3 people then internally there can be the difference in opinions. A better interview evaluation is very essential to judge the right person for the position. In the hiring process after an interview, the decisions are difficult and complicated. A bad hire will cost you waste of recruiting cost, training cost and overall waste of efforts. One cannot just choose the candidates as per his or her own likes and dislikes and personal biases, also if an interview was not that well, does not mean that the candidate is not good. Thus having a formal evaluation process for post-interview evaluation will help to judge everyone in same parameters and negate the personal biases and effect of other personal factors. A good evaluation or a good interview procedure will involve certain set of steps to be followed before, during and after the interview. How to Assess Candidates in Interview? Interviews are the most interesting part in the hiring and recruiting process of an organization. It is at this stage that employers try to gauge their candidates well and also candidates will be given a fair idea regarding the company. Employers try to ask a different type of questions to hire the best candidates, as a wrong hire can cost the organisation in a very negative way. The questions asked in an interview need not be purely technical, they can even ask questions which can be used to understand their personality and other professional traits. However, we would be majorly focusing on things by which we could evaluate better post interview. 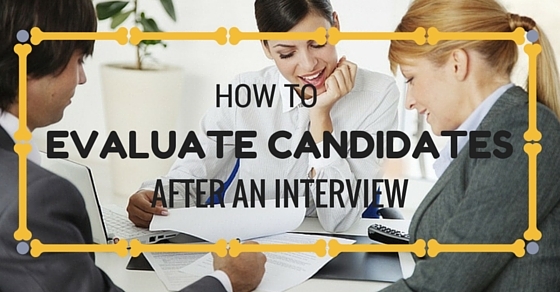 However, the steps before and during the interview cannot be overlooked either. Have a recruitment meeting with HR, Recruiter, hiring manager and a co-worker, you may also include current position holder and the client. a. Discuss on the expectations, roles and responsibilities, required qualification and experience, Behavioral skills. b. Short term and long term goals that the candidate must achieve. c. Assess the company culture and the open position and determine in detail the expected attitude and behaviour of the candidate. During the meeting, it is essential to jot down the main points to make a descriptive job description. Ideally, a job description states- roles and responsibilities, required qualification, experience, and behavioural skills. The job description must be clear and precise. There are various ways to recruitment, there are number of sources like internal hiring, newspaper, job portals, external agencies, internal restructuring and so on. Determine what will suit best for the open position. Screening the resumes is an important aspect. After advertising, the job opening will be receiving several resumes, segregate each of it into three batches- fits mostly, can consider and does not match. Needless to say, the first preference goes to fits mostly batch, if you do not find suitable candidates in the first batch, you may consider calling the second batch for the interview. The third batch can be kept in a database, as it may be suitable for some other position in future. Call the prospective candidates for interview, call and send email, with complete address, things to be brought and job description. Do not arrange more than 3-4 interviews with the same interviewer in one day. Have a quiet room booked for an interview. Arrange water for the candidates in the interview room. The people in the first meeting like – HR, Hiring manager, the person who currently holds the open position will prove as a good interviewer. HR will judge on behavioural, stability and cultural aspects, whereas technical part can be taken care of by the other two interviewers. Internal coordination between the interview panel is essential, the expectations from the candidate must be clear to all. Prepare specific set of questions along with an evaluation form to support it. Asking open-ended questions to the candidate can help analyze on the mentioned parameters in a better way. Some organizations have scoring system whereas some follow ranking system. Evaluation form helps you to gain an overview of the candidate’s capabilities and help in making easy decision. In addition, a formalized hiring procedure rules out the possibility of bad hire. It is very useful as all the candidates are evaluated in the same parameters and thus avoids discrimination of any sort. Ask some better questions instead of asking ‘why’ on each statement the candidate gives, it should not sound like an interrogation but as a mean to know the candidate better. There should be proper give and take during the interview. Lately, organizations conduct interview not as a very formal process but like a friendly chat. One can ask to narrate the situations and the actions that the candidate took. Company’s vision, needs, culture, and how the skills and strengths of the candidate will be of mutual benefit. Candidates like to know whether they will be mentored or they themselves will be the thought leader. A higher position like managers would like to know about the team dynamics. Candidates would like to know the financial status, the salary range that could be offered for the open position. Though a good candidate will do his own research about the culture of the company, but he would still like to have a greater insight about the company environment. These basic questions from the candidate must be answered in detail, or at least he should get a complete overview of what he is getting into. Interviewer should know these answers very well; you should not end up saying too less or revealing more than required. Never let the candidate be in doubt about the further procedures. You should let him know about the tentative result date, or any other further processes like second interview or any other round will be scheduled or not. A candidate left without communication may have bad feelings for the company, which will tarnish the image of the HR or Recruiter, and the Company. Even if the result is negative, intimating the candidate through a polite mail will help to create good relationship and good company branding. A candidate, who is eagerly looking for job, will be attending several interviews elsewhere, if you find the candidate to be good, make sure you confirm with him and provide a good offer as early as possible. If your process is delayed, all the good candidates will be gone and you will have to select from the average candidates, or worse you may have to re-do the whole procedure. So, giving interview feedback on time is useful for hiring the best candidates. For a successful hiring procedure – three criteria’s are very essential, they are- Skills, motivation and cultural fit/attitude. One needs to judge the candidate on these major criteria, it can also be termed as hiring stool; The criteria for interview evaluation which means, if a candidate is lacking in any one of the factor then it will be considered as a bad hire. Educational qualifications supporting to the role is essential, if the role is very technical then educational qualification becomes must. If a candidate has 5 years of experience but the skills you require is not gained by the candidate, then he is as good as a fresher candidate to you. Hence judging on relevant work experience is necessary. If we consider the role of sales as the industry varies, the roles and responsibilities too varies. Evaluate what skillset does the candidate have and does it align with the open position. Evaluate candidate by asking various difficult instances he faced while handling a team or while working in a team, one will get to know the best team dynamics for the candidate. Leadership skills are necessary for a managerial role, ask probing questions on how he handled difficult situations and the way he handles the team in case of crisis. Give candidate a situation and ask him his responses. Evaluate how much time he takes to answer and how thoughtful he is. A good oral and written communication is essential for almost all the job posts. Evaluate the way candidate speaks and responses; you can also have a good look at the resume to find out the errors. Though Error in the resume should not be a reason to reject a candidate, but it does reflect the quality of attention to detail and seriousness towards the job. Overall attitude and the outlook towards work is to be judged. For some people money is the only motivational factor, whereas few will have greater liking towards kind of work, environment etc. Probe in and try to determine what factors motivates him or her, how he likes to be managed. Interviewer should state the next actions clearly, to facilitate the further procedures. Interviewer can note down any further notable observations he had. Apart from the evaluation of interviews, one can judge the candidate on the following points. Body language and non-verbal communication speaks more than words, you can observe the body language of the candidate and judge him/her accordingly. a. Does the candidate seem eager, Observe his tone of voice. b. Does his posture support to his eagerness and willingness to take up the job, an eager candidate will lean forward to give answers. c. What is the career goal, does the opportunity to align with it. d. Does he gives thoughtful responses? e. Observe the Eye contact, good eye contact suggests transparency and honesty, whereas poor eye contact will suggest that the candidate is lying. f. Fidgeting and touching face and hair excessively suggests that the candidate is nervous and lacks self-confidence. Hand gestures while talking certainly suggest stability and confidence. Listening is essential for interviewer and the interviewee, carefully listen to the responses of the candidate and cross-question whenever in doubt. You must probe in and try to figure out the role played by the candidate. Many candidates brag and lie about the things they have not done, probing in will make them confused and would reveal the reality. All candidates are at their best behaviour inside the interview room, but you may ask the receptionist how he spoke to her. You may ask the by passers in parking lot and lobby about his behaviour with others. A rude and arrogant person is definitely not a good hire. During the interview process, you must ask candidates to give 2-3 references. You can validate candidate’s information and get further insight into his skills and the past roles he held. Talking directly to his reporting manager will give you an accurate assessment. Generally, people give vague replies to the questions asked in reference checks, make sure you ask them probing questions and ask them to demonstrate the most remarkable deed he or she did during the association with the company. Other details like salary, Designation should also be checked to ensure the candidate is not lying. Outside references should be avoided as they will give tailored responses and would oversell his or her friend. You may consider supervisors, clients, colleagues for reference checks. This step should be done without fail, because you just cannot blindly believe on what candidate says. Even after the strenuous evaluation process, one can still be in doubt. More often hiring managers are confused to choose between 2- 3 candidates. In such times, having a second interview will help make you decision easier. Many companies look at Facebook, Twitter and LinkedIn account of the candidate. It gives the real picture of the candidate; one can check LinkedIn to see recommendations from friends, colleagues, clients and superiors. One can have a better judgment on personality by looking at the Facebook profile and the tweets he or she uploads. You will get a hint whether he is a good cultural fit. Apart from interview, one can have certain tests that will help you to judge the candidate better. Few of the best evaluation tools are as follows. Few tests like MBTI, Big 5 model test can help to evaluate the personality of the candidate. If a role requires an extroverted and outgoing person, then the person with test result reflecting to have introvert nature may not be a right fit for the organization. Various psychometric tests give a good indication of future performance and help to evaluate whether the candidate has desired skills. In role-play interview, actual work situation is presented to the candidate and thus the on-work attitude, skills, communication, problem-solving and pressure handling can be evaluated, and it gives a better judgment than the traditional interview procedure. An assessment center is a process where people can take different tests including interviews, group exercises, psychometric tests, examinations that help them assess themselves better. It is available in large organizations and it is an expensive procedure. There is no full proof method to evaluate the interviewed candidates, every individual is different and different methods will work for all. However, organizations can choose only one methodology and fixed structure to evaluate. With trials and errors, organizations must find the best fit and should evaluate the candidates in that manner. Keeping abreast with the developments in recruitment and Human resource industry will help gain niche and expertise.